Shearwater celebrated the official opening of its expansive amenities center, The Kayak Club, with a full day of festivities this past Saturday, July 30th. More than 2,500 people attended the Kayak Club’s Grand Opening celebration, and were among the first to swim in the resort-style Lagoon Pool, sample fresh-made smoothies from the Wi-Fi Café, slide down the ‘The Perch’ Three-Story Waterslide, watch an exhibition tennis match on the stadium Har-Tru courts, tour the oversized Fitness Lodge and enjoy the endless fun and activities at Shearwater. The centerpiece of Shearwater is the Kayak Club, home to many of the first-rate amenities available within the community. On Saturday, event attendees explored the spectacular clubhouse and met the builders inside the Kayak Club’s comfortable lounge areas. The Hub, a Wi-Fi café that provides residents with a variety of tasty treats and beverages, offered a fresh-made smoothie tasting and information about Shearwater’s social programs and year-round calendar of exciting events. Outside on the event lawn, families enjoyed a delicious barbecue lunch in the sunshine while watching the K9 Frisbee dog show, playing laser tag, jumping in the bounce castle and having their faces painted. 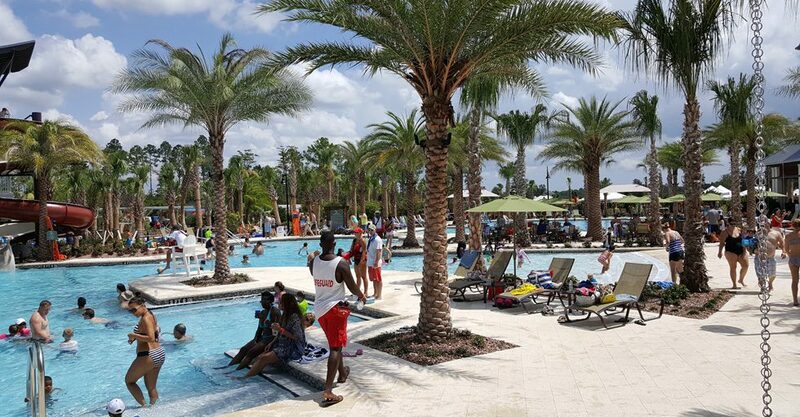 It gets plenty hot here in Florida, but the Kayak Club’s grand opening offered endless opportunities to cool off in the resort-style Lagoon Pool and six-lane Lap Pool. Children and adults alike were delighted by the exhilarating ride down ‘The Perch’ three-story Waterslide Tower and floating along the Lazy Bird River—the longest lazy river in Northeast Florida! At the event, attendees watched workout demonstrations in the oversized Fitness Lodge, featuring a spacious workout room with cardio and weight-training equipment, private group exercise room and even a yoga lawn. Personal trainers led tours and answered questions about healthy living at Shearwater, while the Wellbeats™ system demonstrated virtual fitness classes On Demand. Steps away from the Fitness Lodge, live tennis matches highlighted the spectacular Har-Tru stadium tennis courts. Outdoor enthusiasts also explored some of Shearwater’s 13 miles of trails, perfect for both relaxing family bike rides and invigorating morning jogs. Learn more about Shearwater at the Kayak Club, located at 260 Shearwater Parkway, St. Augustine, FL 32092. The amenities information center is open Monday through Saturday 10am—6pm, and Sunday from 12pm—5pm. Tour model homes by David Weekley Homes, Lennar, Richmond American Homes and MasterCraft Builder Group. D.S. Ware will soon have model homes available to tour in Shearwater’s new gated neighborhood, The Woodlands. Relive all the fun in our Facebook album. Shearwater was recently featured on Channel 4 News.